Just one team entering Monday has reached the conference finals, and it's a club I didn't think would get there without two of its best players in center and captain Steven Stamkos and defenseman Anton Stralman: the Tampa Bay Lightning. They closed out the New York Islanders in Game 5 on Sunday 4-0. The team's other top defenseman, Victor Hedman, had two goals and is now a leading candidate for the Conn Smythe Trophy. He probably would have won the award last season had the Lightning not lost to the Chicago Blackhawks in six games in the Stanley Cup Finals. In 10 playoff games, Hedman, has four goals and five assists and is a plus-4. In 26 playoff games last year, he had one goal and 13 assists and was a plus-11. Hedman had eight points in the series against the Islanders and helped hold New York star center John Tavares without a point in the final four games - all Lightning wins - in which Tavares was minus-5. 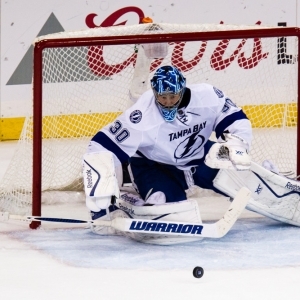 Bolts goalie Ben Bishop had his fifth career playoff shutout Sunday, fourth in the deciding game of a series. That's tied with Martin Brodeur and Jacques Plante for second all-time behind Chris Osgood's five. Bishop also shut out Detroit 1-0 in Game 5 to end that first-round series and two Game 7s without allowing a goal last year. He has a 1.89 goals-against average and .938 save percentage in this postseason. Tampa Bay is currently +500 to win the Cup at Bovada and +210 to win the Eastern Conference. The Lightning don't yet know which team they will face. Washington is in Pittsburgh on Tuesday night in Game 6 of that series with the Penguins leading 3-2. The Pens are +300 favorites for the Cup and -120 in the East. The Lightning could get both Stamkos and Stralman back for that series, although obviously they will be hoping it goes seven games to delay the start of it until this weekend. Stamkos has been sidelined since having surgery to remove a blood clot near his collarbone on April 4. At the time, doctors told him he would be out for between one and four months. He has been practicing. Stralman fractured his left leg on March 25, but he nearly played on Sunday. If those two can get back healthy, I'd favor the Lightning against the Penguins or Capitals even those oddsmakers wouldn't. If you are wondering, Tampa Bay was 3-0 against Pittsburgh this season, each game high scoring (all at least six goals scored). The Lightning were 0-3 against Washington. The Lightning and Penguins have met once in the playoffs: Tampa Bay defeated Pittsburgh in seven games in the first round in 2011. Tampa Bay defeated Washington in each of their two postseason series (2003, 2011). The Penguins are -130 favorites for Tuesday's game against Washington. The Caps will get defenseman Brooks Orpik back after he was suspended three games for a big hit on Penguins defenseman Olli Maatta in Game 2. Maatta has yet to return to the Penguins lineup. There's talk that Penguins coach Mike Sullivan could turn to goalie Marc-Andre Fleury for Game 6 even though he hasn't played since suffering a concussion on March 31. Fleury has been Matt Murray's backup for the past three games. Murray wasn't sharp in Game 5, however, allowing three goals on 19 shots. Fleury finished the regular season with a 35-17-6 record, tying his career high with a .921 save percentage and setting a new career low with a 2.29 goals against average. I'd frankly be surprised if the Pens make a change, although not for a potential Game 7. Sullivan hasn't tipped his hand yet. Murray has played 21 games in his NHL career (he has never faced the Lightning). Fleury has appeared in more than 700. In the Western Conference, St. Louis can close out its series in Game 6 at home vs. Dallas on Monday, while San Jose can do the same in Nashville. I predicted Blues-Sharks before the conference semifinals and will stick with that. St. Louis is the +130 favorite in the West and +350 for the Cup. And I'd take the Blues over either San Jose or Nashville. I believe the Blues finish things off Monday night but that the Predators force a Game 7, which would be Thursday (same as Penguins-Capitals Game 7). We now know all the finalists for the major NHL awards. I'm unable to currently find any Hart Trophy odds for NHL MVP but those will be coming. And Chicago's Patrick Kane will be a favorite. The league's leading scorer is a finalist with Pittsburgh's Sidney Crosby and Dallas' Jamie Benn -- it was a minor upset that Washington's Alex Ovechkin, the NHL's top goalscorer, wasn't a finalist. Kane, who had 106 points, is looking to become the first Blackhawks player to win the Hart Trophy since Stan Mikita won the second of back-to-back MVP honors in 1968. Crosby won it in 2013 and 2007. He finished with 85 points this season. Benn was second to Kane with 89 points. He is the first player in Stars franchise history to be named a finalist for the Hart Trophy. For the Vezina Trophy as top goalie, the finalists are Washington's Braden Holtby, Tampa Bay's Bishop and the Kings' Jonathan Quick. Holtby is a -10000 favorite, with Bishop at +1700 and Quick at +3000. Holtby is going to win this as he tied Brodeur's single-season record of 48 wins. All winners will be announced June 22 during the NHL awards ceremony in Las Vegas, which is probably getting an NHL team in two years. That could be made official any day. $60 worth of member's NHL picks absolutely free - no obligation, no sales people - you don't even have to enter credit card information. You can use this $60 credit any way you please on any of our top hockey handicappers. Get your free picks by clicking here! Also, for a limited time get three hockey handicappers for the price of one! Click here for our 3-for-1 NHL picks offer.